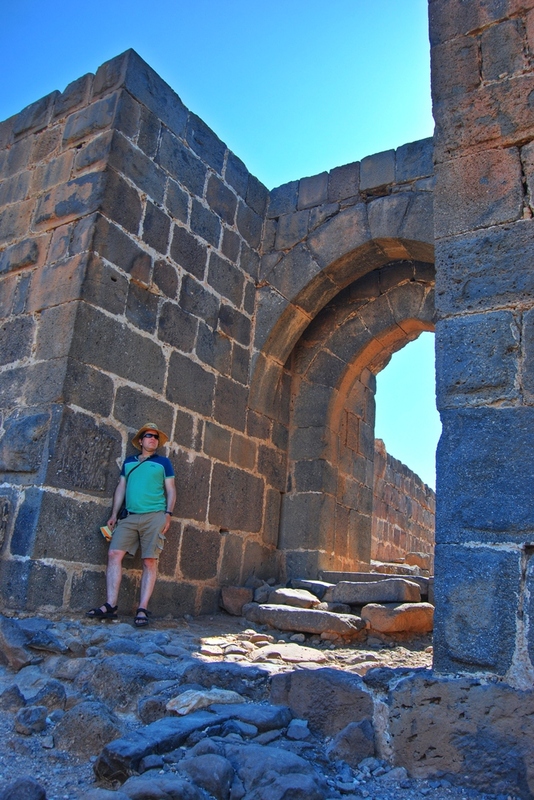 Ruins of an impressive Crusaders fortress located on a high cliff above above the northern Jordan valley. 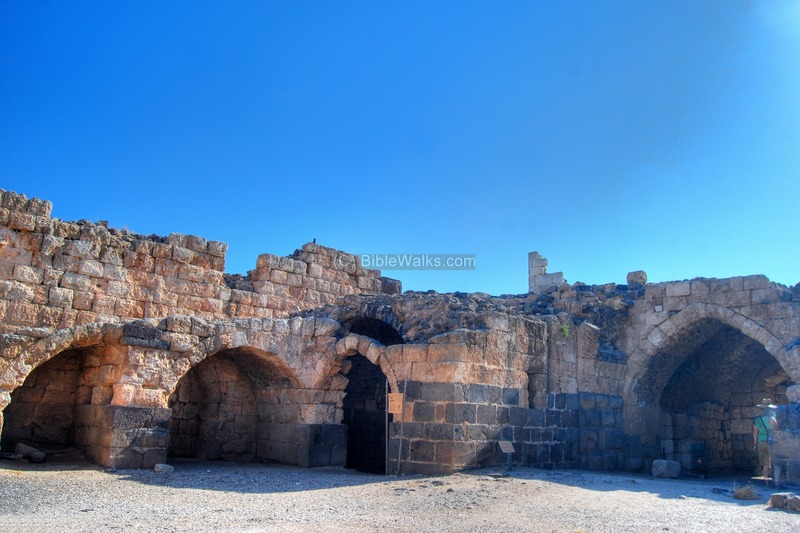 Belvoir fortress is an impressive Crusaders fortress above the northern Jordan valley. Built in 1168 by the Hospitallers order, it withstood a year and a half siege of Saladin's forces. 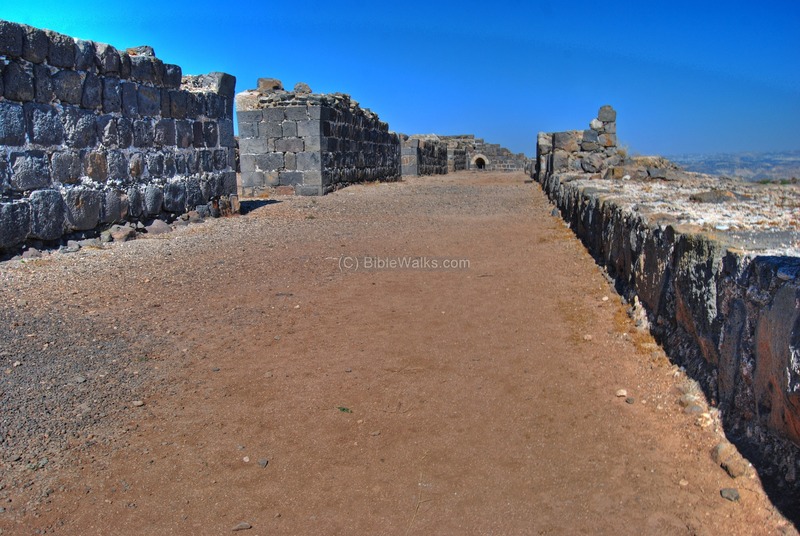 Today the reconstructed fortress is a must-see National park of Kokhav HaYarden. Belvoir fortress is located on an the edge of a cliff, at a height of 312m above sea level, and 550m above the valley of the Jordan river. The Crusaders arrived from Europe to the Holy Land in order to liberate the Holy Land and free Jerusalem. They accomplished the mission in 1099, and established the Crusader Kingdom. Then they began to construct fortresses along the borders, ports and main roads. 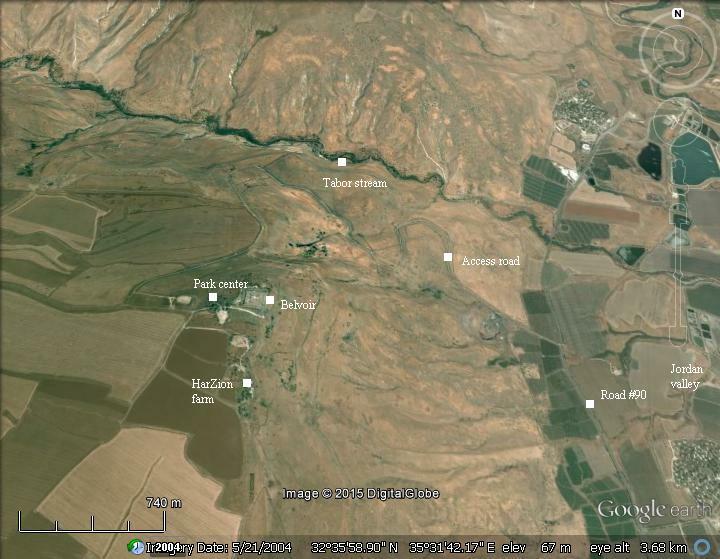 Belvoir was one of these strongholds along their eastern borders, overlooking the main north-south road along the Jordan valley. The Hospitallers order: Monks from the Benedictine order (Order of St Benedict) tended the sick and wounded warriors in Jerusalem. This group evolved into a new local group that combined the religious zeal together with the Crusaders military life. The order, officially established in 1113, named their order after John the Baptist, and were called the "Knights Hospitallers of St. John", or commonly known as the Hospitallers. At the 11th C they purchased and renovated a church and monastery of St John the Baptist, and their living quarters and the hospital structures were located near the Sepulcher Church. This order, as other Crusader military orders, became powerful and well financed. They purchased lands and castles from landowners who were in financial trouble. This was the case in Belvoir. The land around Belvoir was purchased in 1168 by the Hospitallers order from Ivo of Velos, a French noble, for a substantial sum of 1,400 gold Bezants. The Gold Bezant was an imitation Crusader gold coin, imitating the Muslim Dinar, weighing 3.8 gram. Based on the gold value today, the purchase was for an equivalent of 200,000$. In 1168 the Hospitallers built the fortress on an area of 12 Dunams (3 acres). It was built with two lines of defensive walls, one inside the other, in a concentric form. Its architecture and quality of construction was one of the Crusaders' best built structures in the Levant. It served as a model for future Crusader fortresses based on a concentric castle plan, which is regarded as the last stage of Medieval castle construction. In Europe the first concentric castle was in Dover (1181), when a second external wall was added. This castle type reached a peak in Europe during the 13th Century. The Crusaders called the fortress Belvoir, or Beauvoir - French and Latin for "fine view". Indeed, the fortress with the great view of the Jordan valley deserves this title. During the first 10 years Belvoir did not engage in wars. This peaceful state changed when the Ayyubid forces of Saladin started to fight the Crusaders in an effort to drive them out of the Holy Land. The Ayyubid Muslim dynasty was founded by Saladin (Salah ad-Dīn Yusuf ibn Ayyub). They ruled Syria and Egypt in the years 1171-1341. Saladin, a Muslim of Kurdish origin, conducted his first battle against the Crusaders in 1177, at Mons Giradi near Ramla, but was defeated by Baldwin IV King of Jerusalem. However, Saladin learned from his defeat and in 1179 he was victorious at the battle of Marj Ayyun (Lebanon). A truce was arranged between Saladin and the Crusaders that lasted for two years. During the battles of 1181-1183 the Muslim forces attempted to take the Belvoir fortress, but could not capture it. A great battle of Forbelet near the fortress in summer of 1182, headed by King Baldwin IV and Saladin, ended as a tactical draw, with both armies walking away with light casualties. The tide against the Crusaders turned after 5 years when Saladin's forces defeated the Crusaders in the decisive battle of Hittim (July 4, 1187). Following this victory, the Galilee remained without a regional force that could repel the Ayyubid forces, and the fortified Crusader cities - Acre, Tiberias and Haifa - were captured. The fortress was on siege for a year and a half. Only on January 5, 1189, the Muslim fighters managed to knock down the eastern tower and walls, resulting in the surrender of the defending Knights. A second Crusade was launched in 1189, and the Galilee was recaptured two years later. Belvoir was in Muslim hands until 1219, then demolished by 1228. The ruined fortress was given back in the years 1243-1263 to the Hospitallers following a deal between Richard Earl of Cornwall and the Governor of Egypt, but it was not repaired. In the 18th Century the ruins of the fortress were resettled by Bedouins. The village was named Kaukab el-Hawa (Arabic for "star of winds"). The village existed until 1948. Archaeological excavations were held here in 1963 (Tamari and Tsuri) and 1966-1968 (M. Ben Dov). An aerial view of Belvoir fortress is seen here, as captured from the west side. The circumference of the outer walls is 480m. A 20m wide moat surrounds the walls. In the background is the Jordan valley, which is 550 meters below the fortress, and the mountains of Gilead. The recommended tour of Belvoir starts from the main gate on the south eastern side (far right), continues through the various sections of the fortress, and then exits from the modern bridge on the west (lower) side. Another drone view from the east side is seen in the next photo. The fortress defenses started from a deep dry moat, 20m wide and 10m deep, which was cut out from the bedrock. It was cut on three sides - western, southern and northern - while the eastern side defense was based on the natural slope of the cliff. This picture, from the south west corner, shows the ruins of the fortress and the deep moat around it. The moat was made by cutting out the local basalt stone around the platform on which the fortress was built. The hewn blocks were then used to build it. On the western side of the fortress is a modern bridge where the visitors can walk over the moat. During Crusaders times, a wooden drawbridge used to connect the fortress to the western side. It was based on a tall stone pillar towering over the center of the moat, and a wooden part which could be raised to disconnect the fortress. A view of the moat, bridge and south western corner tower is seen in the following photo. The next photo shows a closer view of the corner tower. On the bottom of the tower is a concealed exit, or "postern", which is common in fortress plans. It is also termed "sally port", meaning a secondary door used to harass the enemy, based on the Latin word meaning 'to jump'. this secret exit port allowed the defenders to sneak out the castle during a siege, in order to hit the enemy by surprise or to send out messengers for help. A hidden staircase inside the corner tower allows an access from the top of the fortress down to the postern. In Belvoir, the suggested tour descends on the south western corner and then ascends on a staircase in the middle of the western wall. The main entrance to the fortress is on the south east corner. Its location is marked by a yellow square on the illustration on the right. During the Crusaders times, a stone bridge over the moat connected the eastern side to the main gate. The main gate is based on the local, dark, basalt stones, and decorated with a white limestone arch. The combination of limestone and basalt can also be seen in the arrow slit. After passing the main gate, a passageway looped between high walls to pass through the eastern inner gate. Its location is marked by a yellow square on the illustration on the right, near the main gate. The photo below shows the main gate on the end of the left row, which then turned into the second row to its right. After passing the double corridors, the inner eastern gate protects the entrance into the fortress. It had double wooden doors, which were reinforced with iron. The door hinges of the gate are seen in the following photo. The eastern walls overlook the Jordan valley. What a view! Now wonder why the Crusaders named it Bel-Voir (fine-view). On this east side, extending beyond the eastern walls, was a high outer tower. Only the bases of its walls remained. This type of outpost is known as "the Barbican". 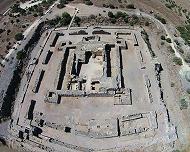 The word is based on the Latin word "Barbecana", meaning "outer fortification of a castle". The Arabs call it "Bashura". The remains of the tower can also be seen below on the right (east) side. The the Muslim assault of 1189 targeted this tower as their focus of the assault, and once they destroyed it the Crusaders knights surrendered. The northern edge of the eastern walls are viewed in this next photo. At the end of the walls is the north eastern corner tower. On the east side is a plastered water cistern and bathhouse. Water supply to the fortress was from runoff rain water and by an aqueduct that brought waters from a spring which is located south of the site. The fortress was protected by four corner towers. The photo below shows the remains of the north eastern corner tower. It is square, extending 5m beyond the walls of the fortress, thus allowing the defenders to view the length of the moat and the walls. Its location is marked by a yellow square on the illustration on the right. 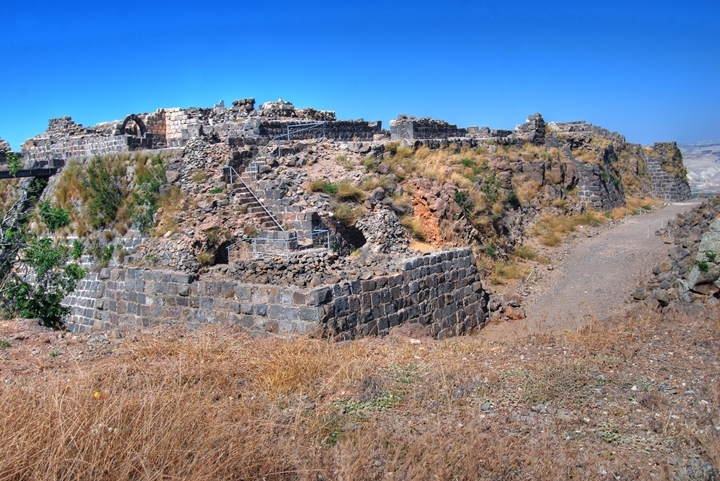 The inner eastern gate opens up into a network of corridors that surrounded the fortress. These corridors were covered, based on vaults that supported the roof. The remains of one of the arches of the vaults can be seen on the left edge of this wall that separated the outer fortress vault to the courtyard. The next photo shows a long corridor, 6-7m wide, which is located along the entire south side of the fortress. This southern vault probably served as stables and storerooms. Sections of the arches of the vaults can be seen in several locations along the walls. It has three openings, on the left wall, into the courtyard. A rectangular courtyard separated the outer side of the fortress and the inner fortress. This castle plan is known as "Motte and Bailey", where "Motte" is the inner raised fortress (based on the French word Motte meaning: turf) while the "Bailey" is an enclosed courtyard (based on French word "Baillle" meaning: low yard). On the western side of the courtyard is the entrance to the inner fortress. It has two sets of gates, a gatehouse and a tower. The two gates are perpendicular to each other in order to slow down the enemy in case of a breach of the first gate. In the center of Belvoir was the inner fortress, covering an area of 40m by 40m. It had four towers on each of its corners. The inner fortress was taller by 2m than the outer corner towers. Steps lead up to its second level. The location of the south vault of the inner fortress is marked by a yellow square on the illustration on the right. The inner fortress is known as "the keep" (English), Donjon (French) or "Bashura" (Arabic). It was a strong central tower which is used either as a inner fortress or dungeon (hence the name Donjon). In medieval castles this inner tower protected the defenders in case the main walls were penetrated, and in daily life it served as the residence of the knights and commander of the fortress. The inner fortress of Belvoir is in a good state of preservation. The barrel vaults supported the covered roof. The high ceilings created a cool place during the heat of the summer, and allowed to heat up the rooms during the cold winters. In the center of the inner fortress was a central paved courtyard ("Bailey"), 22m by 22m in area. The location of the central courtyard, inside the inner fortress, is marked by a yellow square on the illustration on the right. A laundry yard and cistern is located inside the central courtyard, as seen below. The cover of the cistern is seen in the following photo. The pool in the corner was used to wash the laundry. A kitchen with three built stoves is located on the eastern wing of the inner fortress. Another section of the kitchen is below. The dining room was located on the southern wing. A "Nine-Men Morris" strategy game board was carved on one of the stones. This game, also called Merels or Cowboy checkers, was played by two players with twelve stones each. This type of game started to be played in the Late Bronze age, with its popularity peaking in the Medieval periods. It is normally printed on the back of a chess game board. On both sides of the Crusader fortress are additional attractions. To the south is a "statue park" - a collection of metal statues created by Yigal Tumarkin, one of Israel's leading painters and artists. The sculpture garden was created between the years 1994 to 1996. 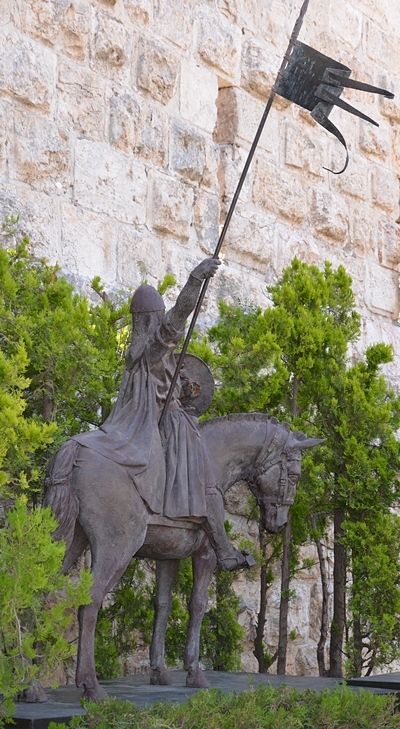 This famous artist had a "Crusader" bug since his service in the Navy in the Atlit Crusader fortress, and his Crusader-inspired sculptures are on display here as well as in Ramle and Acre. On the north side of the fortress is a feeding station for Griffon vultures and other raptors. It is part of a Country wide conservation program to protect them. There used to be thousands of such birds nesting in the steep cliffs, but in the past 50 years the raptors became endangered species. Feeding stations, educations and research programs are part of collaborated programs set to protect the the birds. Several Kilometers to the north of Belvoir is a valley of Tabor stream, a nature reserve area. This picture shows the valley, with Mt. Tabor in the background. Kaukab el-Hawa - Arabic for "star of winds"
Kochav - Hebrew for "star". The name of a Roman period Jewish village which was located nearby; some of its stones were reused by the Crusaders. Kochav HaYarden - Hebrew for "star of Jordan".